The Nuclear AMRC now offers world-leading capabilities in bulk additive manufacturing, with the installation of a £1 million automated cell built by Kuka Systems UK. Like a heavy-duty version of the now-familiar 3D printer, the bulk additive manufacturing cell can build high-integrity parts from the ground up, and add metal features to large forgings such as pressure vessels. The new facility is funded by the High Value Manufacturing Catapult. 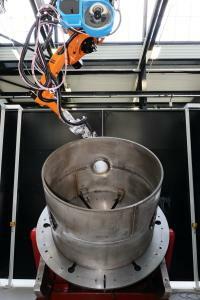 The 10 by five metre cell features a six-axis Kuka robot arm, mounted on a three-axis nine metre gantry, plus a two-axis manipulator with 3.5 metre diameter turntable. The robot initially carries a ‘toptig’ arc welding system, which integrates the wire feed into the welding torch, and has been developed by Air Liquide specifically for robotic welding applications. 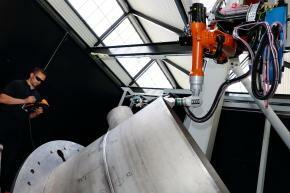 The robot will work directly from a CAD model to lay down weld material to create three-dimensional geometries. As well as creating near-net shape parts, the cell can also add non-critical structural features to large pump and valve casings or pressure vessels, reducing the initial size and complexity of expensive forgings or castings. The technology builds on previous research at the Nuclear AMRC and its sister centre, the AMRC with Boeing, into the shaped metal deposition technique which builds large near-net shape parts from welded wire. The new robot is able to carry a selection of end effectors, allowing the Nuclear AMRC team and partners to investigate a range of welding technologies using metal powder and wire, and to inspect and finish parts in a single set-up. The design of the cell helps avoid contamination problems that can arise in traditional powder-bed additive machines. The flexibility of the cell will also allow the technology to be more easily introduced into established factories. To see the cell being installed and tested, watch the video below. Engineering: an unsuitable job for a woman? Friday 10 July, AMRC Knowledge Transfer Centre. The Nuclear AMRC is honoured to host an exclusive presentation by Professor Dame Athene Donald on gender balance in science and engineering. Professor Dame Athene Donald DBE FRS is professor of experimental physics at the University of Cambridge, and chair of the Athena Forum, an independent organisation focusing on diversity in science, technology, engineering, mathematics and medicine. Professor Donald says: “Nearly half a century on from the equal pay act, true equality between men and women remains a distant goal. Both in terms of pay, and in terms of the jobs they fill, men and women fare very differently. “The engineering profession is one where women are by and large conspicuously absent. Schools frequently do not encourage girls to think about engineering as a career and too often cultural stereotypes rule. The event is free to staff and students at the University of Sheffield, and supported by the Faculty of Engineering and Women@TUOS. For more information, see the Women@TUOS events page.